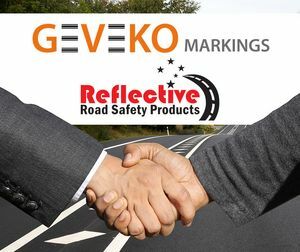 Geveko Markings produces and sells road markings, decorative markings, skid resistant markings and other types of horizontal signage to markets around the world. We focus our business on supplying the right material to road markings and line markings and we have over 90 years of experience from the industry. Competent sparring, expertise and knowledge are the factors we rely on to guide you in the right direction when you have a road marking job to do! Application of preformed thermoplastic markings is easily done with an hand held gas burner, and you can do the application almost all year around. ViaTherm® is a certified thermoplastic road marking material for a wide variety of normal, special and structural markings. Suitable for both Type I & II markings. PlastiRoute® cold plastic traffic markings meet the demanding requirements of marking reliably at high traffic loads or in varying weather conditions. AquaRoute® water borne paint is ideal when it comes to easy application of road markings. It is environmentally friendly with no special restrictions to work safety. DecoMark® markings provide solutions for individual and special designs of logos, games and much more. Your imagination is the only limit! When the Cornwall-based educational charity, Eden Project, recently needed to refurbish the pathways in their awe-inspiring gardens, Adtex Resin Bonded Paving provided the perfect solution. This 200 m2 large DecoMark® map provides a both practical and decorative overview of the National City Park in Porvoo, Finland. Since 2016, nine hospitals in Southern Germany have had PREMARK® markings applied in the form of landing areas for emergency helicopters. A combination of PlastiRoute® RollGrip® and DecoMark® livens up Trondheim Central Station with brightly-coloured geometric shapes, lines and a map of Norway. An eye-catching 3D crossing in PREMARK® makes drivers in Tauranga slow down due to its fantastic optical illusion. The newly applied marking appears to be floating in the air and thus offers is a new twist to the traditional plain pedestrian crossing that also aims to make the roads safer. In order to put focus on speed limits and thus reduce the risk of accidents, a combination of bright red PlastiRoute® and PREMARK® speed limit symbols have been applied on this road stretch in the city of Dubai.